Blue (predominantly blue or blue-green on the upper half and browns and ochres in the lower half). Gold (predominantly browns, ochres, to yellow-green on the upper half and blue toward the base. However, there is much variation in placement of all the above colours on pieces and the distinction between Blue and Gold was abandoned after a couple of years in production. These mixed-coloured pieces and pieces with other colour combinations are listed separately here. 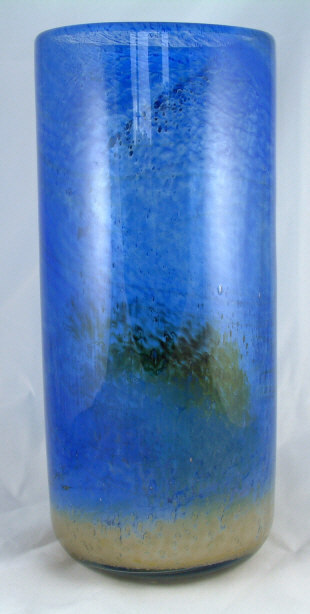 Large cylinder vase, 25 cm high. 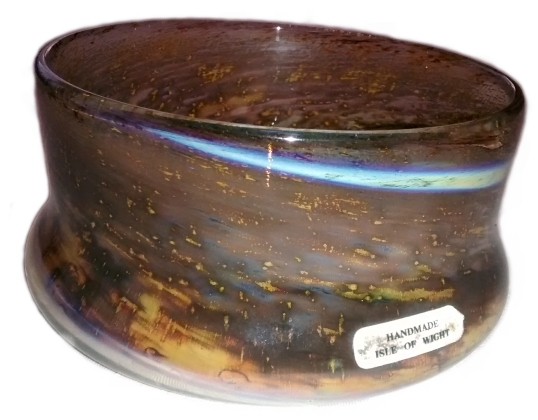 Dish 21.5 cm diameter and 3.5 cm deep with flame pontil mark. Made 1974-c.1980. Dishes are very scarce, especially in this larger size. A dish in this shape but 16 cm in diameter is a little more common than the larger dish, but still scarce. 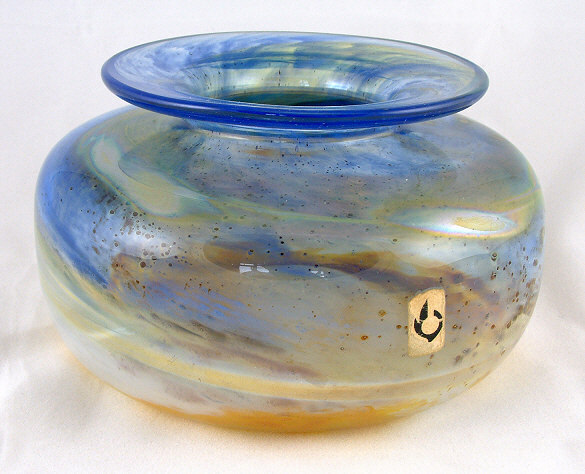 A square stoppered vase, 16 cm high. Note that the stalk of the stopper is quite slender and much smaller than the hole at the top of the bottle. This flattened circular vase is 13 cm in diameter and 8 cm high. It has the shape number AB9. 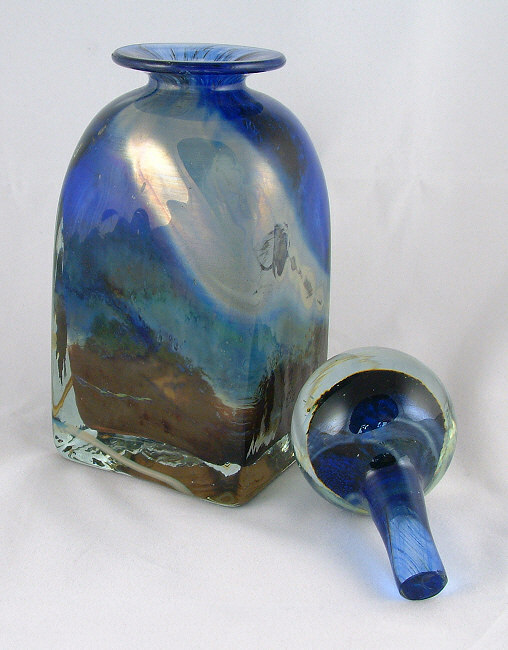 Small attenuated bottle, 37 cm high. 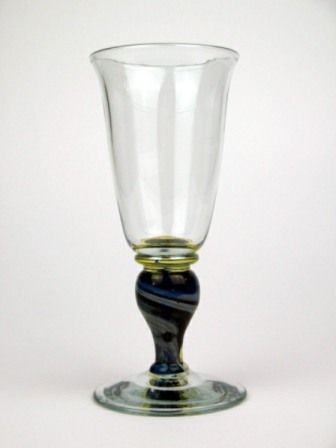 Attenuated bottles were also produced 46 cm tall. The smaller size is the scarcer, but all bottles are comparatively scarce. Elephant foot vase with a 14 cm diameter base, 12.8 cm rim and 7 cm high. It has an oblong label and heavy flame pontil mark on the base indicating an early date of manufacture. A rather unusual Aurene cylinder vase measuring 16.0 cm tall x 6.6 cm in diameter. It has a flame prunt. Its identity was confirmed by Ron Wheeler. Image courtesy of Mike Collinson. 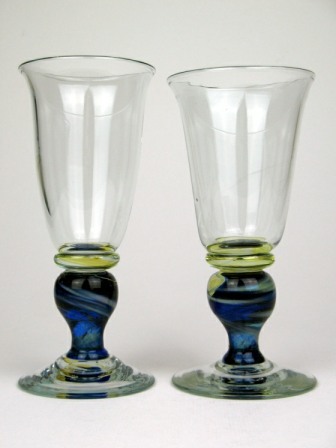 These goblets have knops with colours similar to Aurene. The label with "Hand Made Isle of Wight, England" is attached to the underside of the base on one of them. It is thought these date from the mid-1970s and made by Michael Harris. They stand about 19.5 cm high and 9 cm across at the rim. Images courtesy of Jonathan Joseph. 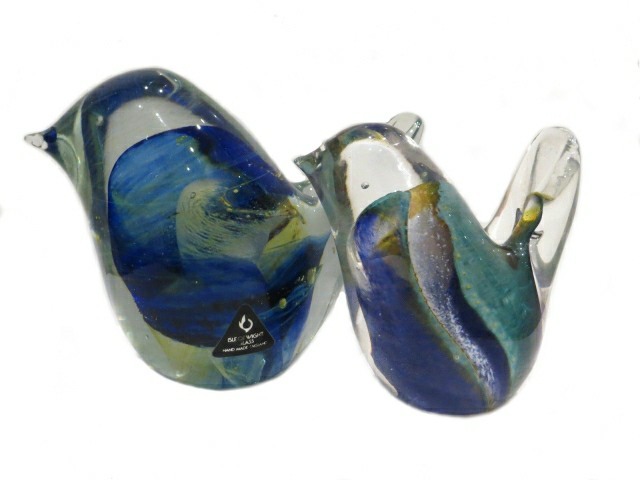 These large bird paperweights have colours similar to Aurene and probably date from around 1980. The bigger bird is 9 cm tall x 12 cm long from the beak to the end of the tail and the smaller one is 8 cm high x 8 cm long.